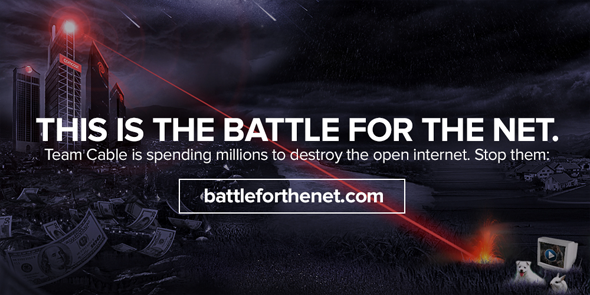 The battle over Net neutrality has actually been going on for quite a while, but thanks the battle for the net campaign it’s finally getting some attention. Net neutrality is the principle that Internet service providers and governments should treat all data on the Internet equally, not discriminating or charging differentially by user, content, site, platform, application, type of attached equipment, and modes of communication. The term was coined by Columbia media law professor Tim Wu in 2003 as an extension of the longstanding concept of a common carrier. Proponents often see net neutrality as an important component of an open Internet, where policies such as equal treatment of data and open web standards allow those on the Internet to easily communicate and conduct business without interference from a third party. A “closed Internet” refers to the opposite situation, in which established corporations or governments favor certain uses. A closed Internet may have restricted access to necessary web standards, artificially degrade some services, or explicitly filter out content. Fight For The Future’s new campaign attempts to let people know that their access to free information and freedom of speech is being threatened. Remember the great Internet blackout of 2012? With months of organizing culminating in one coordinated day of action, we stopped SOPA and PIPA and gave birth to the Internet Defense League — a massive grassroots network of websites large and small ready to fight back whenever the free and open Internet is threatened. Now, this plan to kill net neutrality is perhaps the most fundamental threat the Internet has ever faced. You can sign to stand against a closed internet, here. Previous: Why Are All These People Pouring Buckets Of Ice Over Themselves?